Hair Transplant is an art mastered by very few around the world. Body hair to head transplant (BHHT) makes this even more daunting because the body donor hair has different characteristics (hair colour, curl, diameter etc.). But in the right hands, robust body hair is a boon to get rid of extensive hair loss. Dr. A’s hair restoration centre (being the inventor of BHHT as well as having the longest experience in this field) is considered as one of the world’s leading centre for BHHTs. One of the revolutionary milestones in hair transplants is the ability to use body hair for transplant on the bald scalp. Dr. A’s clinic was one of the first clinics in the world to perform body hair to scalp transplants (BHHT) and is widely recognised as one of the pioneer in mega session body hair to scalp transplant worldwide. Research concluded that body and beard hair can be successfully used as additional donor hair and the patient acceptability of the same was high. 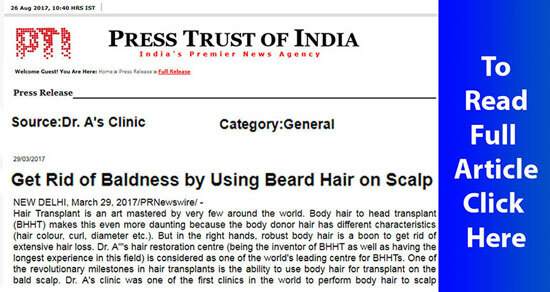 Its a matter of pride that the world’s first documented published study of Beard Hair to Scalp Hair Transplant was documented and published in peer reviewed, indexed medical journal - Indian Journal of Plastic Surgery(Volume 46, Issue 1, Jan - April 2013) by an Indian doctor - Dr. Arvind Poswal. This original invention opens up wonderful new avenues of treatment for even severely bald people. For patients with robust body hair, BHHTs (Body Hair to Head Transplants) increase available donor hair supply. When coupled with existing donor supplies, body/facial hair gives patients more graft placement options. These options include aggressive hairlines, conservation of scalp hair and greater density. Facial/body hair can substitute scalp hair, which is ideally suited for the frontal region. In addition, thick facial hair mixed in with thinner scalp hair results in a very natural look. A pioneer in various aspects of hair restoration, Dr. Arvind Poswal is the first hair transplant doctor from India to be granted membership of the prestigious American Hairloss Association and to be featured on USA-based the bald truth radio, Fox News etc. He has also trained numerous doctors in the field of hair transplant, some of whom now work in the USA while others work alongside him at his centre. Preshave the body donor areas 3 to 5 days before the extraction. It is a simple step and very helpful to pinpoint the actively growing hair that need to be used. Use only the body donor hair in active growing phase for the purpose of transplant. Do not use telogen hair. Assume the transplanted body hair will retain their original characteristics (length, calibre, colour, predisposition to greying, curl, anagen/telogen % ages and hair growth cycles). Factor in the impact of growth cycles and characteristics of the body donor hair proposed to be transplanted. Mix the various body as well as scalp donor hair in any particular area of scalp. Few of his articles have been published in peer reviewed, indexed medical journals over the years. Body hair transplant: An additional source of donor hair in hair restoration surgery - Indian Journal of Dermatology (Volume 52, Issue 2, Year 2007). The preshaving protocol in body hair-to-scalp transplant to identify hair in anagen phase - Indian Journal of Dermatology issued(Volume 55, Issue 1, Year 2010). When fue goes wrong - Indian Journal of Dermatology issued (Volume 56, Issue 5, September - October 2011). Use of body and beard donor hair in surgical treatment of androgenic alopecia - Indian Journal of Plastic Surgery issued (Volume 46, Issue 1, Jan - April 2013). Expanding needle concept for better extraction of body hair grafts - Indian Journal of Dermatology (Volume 58, Issue 3, May - June 2013). For any hair or hair loss related query, please email us at contact@fusehair.com, or visit us at Dr. A’s Clinic. So which statement is true Dr A?